Home > Barnsley > No more “ruff” rides for Baby driver! No more “ruff” rides for Baby driver! 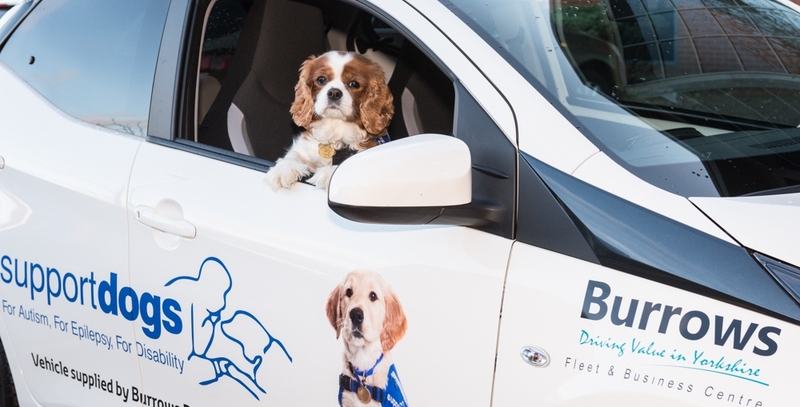 Disability assistance dog Baby couldn’t wait to test drive Support Dogs’ new car, generously donated by Burrows’ Business Centre in Barnsley. The Cavalier King Charles Spaniel is one of several canines trained by the Sheffield-based charity Support Dogs, enabling their owners to lead safer, more independent lives. The charity relies entirely on donations and sponsorship to fund its three training programmes for assistance dogs to support children with autism and adults with epilepsy and physical disability. Burrows have been sponsoring Support Dogs for the past two years and have now donated a brand new Toyota Aygo to the charity, whose national training centre is in Brightside.